Washington’s failures are everywhere visible. We can see the failures in Washington’s wars and in Washington’s approach to China and Russia. The visit of Chinese President Xi Jinping, was scheduled for the week-end following the Pope’s visit to Washington. Was this Washington’s way of demoting China’s status by having its president play second fiddle to the Pope? Washington’s cyber incompetence and inability to maintain cyber security is being blamed on China. The day before Xi Jinping’s arrival in Washington, the White House press secretary warmed up President Jinping’s visit by announcing that Obama might threaten China with financial sanctions. And not to miss an opportunity to threaten or insult the President of China, the US Secretary of Commerce fired off a warning that the Obama regime was too unhappy with China’s business practices for the Chinese president to expect a smooth meeting in Washington. In contrast, when Obama visited China, the Chinese government treated him with politeness and respect. China is America’s largest creditor after the Federal Reserve. If the Chinese government were so inclined, China could cause Washington many serious economic, financial, and military problems. Yet China pursues peace while Washington issues threats. Like China, Russia, too, has a foreign policy independent of Washington’s, and it is the independence of their foreign policies that puts China and Russia on the outs with Washington. Washington considers countries with independent foreign policies to be threats. Libya, Iraq, and Syria had independent foreign policies. Washington has destroyed two of the three and is working on the third. Iran, Russia, and China have independent foreign policies. Consequently, Washington sees these countries as threats and portrays them to the American people as such. 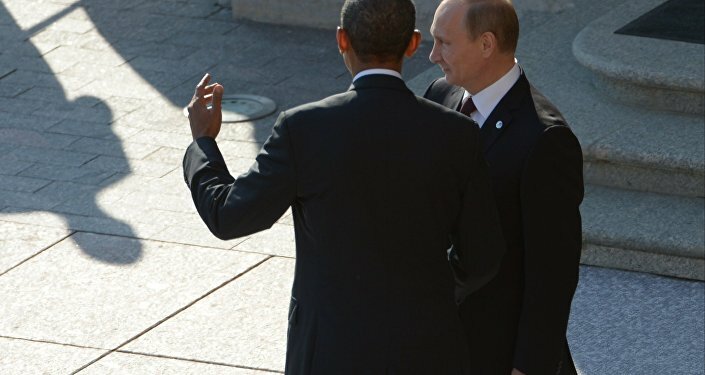 Russia’s President Vladimir Putin will meet with Obama next week at the UN meeting in New York. It is a meeting that seems destined to go nowhere. Putin wants to offer Obama Russian help in defeating ISIS, but Obama wants to use ISIS to overthrow Syrian President Assad, install a puppet government, and throw Russia out of its only Mediterranean seaport at Tartus, Syria. Obama wants to press Putin to hand over Russian Crimea and the break-away republics that refuse to submit to the Russophobic government that Washington has installed in Kiev. Despite Washington’s hostility, Xi Jinping and Putin continue to try to work with Washington even at the risk of being humiliated in the eyes of their peoples. How many slights, accusations, and names (such as “the new Hitler”) can Putin and Xi Jinping accept before losing face at home? How can they lead if their peoples feel the shame inflicted on their leaders by Washington? Xi Jinping and Putin are clearly men of peace. Are they deluded or are they making every effort to save the world from the final war? One has to assume that Putin and Xi Jinping are aware of the Wolfowitz Doctrine, the basis of US foreign and military policies, but perhaps they cannot believe that anything so audaciously absurd can be real. In brief, the Wolfowitz Doctrine states that Washington’s principal objective is to prevent the rise of countries that could be sufficiently powerful to resist American hegemony. Thus, Washington’s attack on Russia via Ukraine and Washington’s re-militarization of Japan as an instrument against China, despite the strong opposition of 80 percent of the Japanese population. “Democracy?” “Washington’s hegemony don’t need no stinkin’ democracy,” declares Washington’s puppet ruler of Japan as he, as Washington’s faithful servant, over-rides the vast majority of the Japanese population. Meanwhile, the real basis of US power—its economy—continues to crumble. Middle class jobs have disappeared by the millions. US infrastructure is crumbling. Young American women, overwhelmed with student debts, rent, and transportation costs, and nothing but lowly-paid part-time jobs, post on Internet sites their pleas to be made mistresses of men with sufficient means to help them with their bills. This is the image of a Third World country. Another indication of a third world country is large inequality in the distribution of income and wealth. According to the CIA itself, the United States now has one of the worst distributions of income of all countries in the world. The distribution of income in the US is worse than in Afghanistan, Albania, Algeria, Armenia, Australia, Austria, Azerbaijan, Bangladesh, Belarus, Belgium, Benin, Bosnia/Herzegovina, Burkina Faso, Burundi, Cambodia, Cameroon, Canada, Cote d’Ivoire, Croatia, Cyprus, Czech Republic, Denmark, Egypt, Estonia, Ethiopia, Finland, France, Germany, Ghana, Greece, Guinea, Guyana, Hungary, Iceland, India, Indonesia, Iran, Ireland, Israel, Italy, Japan, Jordan, Kazakhstan, Kenya, South Korea, Kyrgyzstan, Laos, Latvia, Liberia, Lithuania, Luxembourg, Macedonia, Malawi, Mali, Malta, Mauritania, Mauritius, Moldova, Mongolia, Montenegro, Morocco, Nepal, Netherlands, New Zealand, Nicaragua, Niger, Nigeria, Norway, Pakistan, Philippines, Poland, Portugal, Romania, Russia, Senegal, Serbia, Slovakia, Slovenia, Spain, Sweden, Switzerland, Taiwan, Tajikistan, Tanzania, Timor-Leste, Tunisia, Turkey, Turkmenistan, Uganda, Ukraine, UK, Uzbekistan, Venezuela, Vietnam, and Yemen. The concentration of US income and wealth in the hands of the very rich is a new development in my lifetime. I ascribe it to two things. The other cause of the extreme inequality that now prevails in the US is what Michael Hudson calls the financialization of the economy that permits banks to redirect income away from driving the economy to the payment of interest in service of debt issued by the banks. Both of these developments maximize income and wealth for the One Percent at the expense of the population and economy. As Michael Hudson and I have discovered, neoliberal economics is blind to reality and serves to justify the destruction of the economic prospects of the Western World. It remains to be seen if Russia and China can develop a different economics or whether these rising superpowers will fall victim to the “junk economics” that has destroyed the West. With so many Chinese and Russian economists educated in the US tradition, their prospects might not be any better than ours. The entire world could go down the tubes together.